The first semester is wrapping up. I've got a few more lessons to teach and semester tests to write/give/grade. One new thing I've implemented this year is a unit reflection sheet. 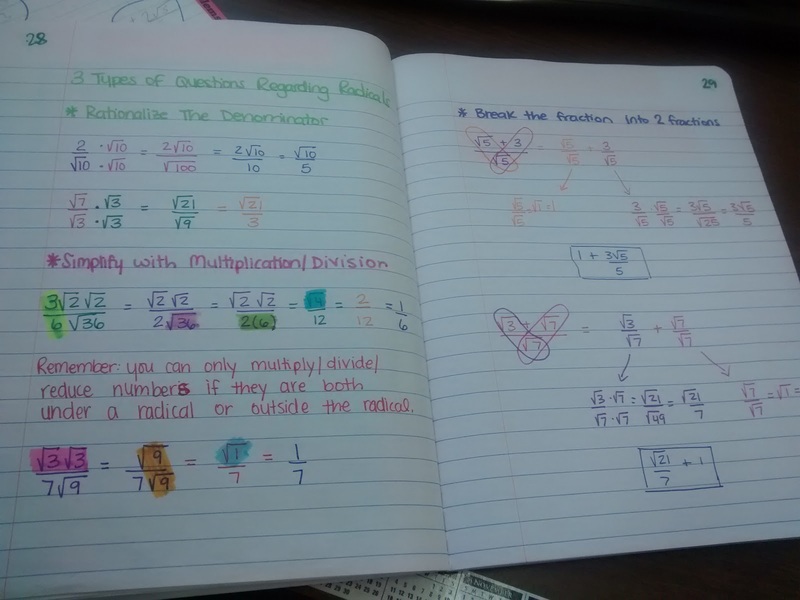 At the end of each unit when students have demonstrated mastery on all of that unit's quizzes, students fill out this reflection sheet, staple their graded quizzes to it, and turn it in with their completed notebooks. I ask my students to reflect on each unit. I, on the other hand, am going to reflect on my first semester of using reflection sheets. * Not putting a space for students to write their name on this sheet was a huge mistake. * It's been interesting to read the students "Why?" answers for which skill they are most confident with and which skill they found most difficult. Some students, of course, write things like "#2 because it's easy" or "#5 because it's hard." Other students have actually taken the time to reflect on what made a specific skill easy or hard for them. * Either way, I'm excited that when I had back the packets at the end of the year to review for the end-of-instruction exam that students will automatically have a list of which skill they need to work on the most in each unit to prepare. If I choose to do this again, I will be more adamant about students explaining why something was easy/hard. * I like that students have to go back and look at their errors and formulate a plan for avoiding those errors in the future. Each reflection sheet is sort of a note to themselves to read/act on in the future. * I had big hopes for the summary section, but it hasn't worked out exactly as I'd anticipated. For the one word summary, I had meant for students to choose one math word that summed up the unit. But, a lot of my students are picking words that describe how they feel about the unit such as "challenging." Or, they're like my stats students who summarize our box plot unit as "boxy." * For the one sentence summary, I'm realizing that many of my students don't know how to write a sentence. One word is not a sentence! These sentences are almost always their opinion of the unit. I guess I'm still getting feedback about what they feel, so it's not what I was intending but it's also not useless. * Lastly, students have to do a mind map summary. Mind map. Concept map. Bubble map. Web. Whatever you want to call it. I had this vision that students would comb through their notes and put a lot of thought into this. Ummm...no. They copy the titles of a few units into bubbles and call it good. A few students have been making a number line of sorts and ranking the skills from easy to hard. Basically, I've been letting students turn in their reflection sheets if they have something written there. * I need to do a better job of holding kids accountable for doing things the way I want them to. At the bottom of the form, there's a place for me to mark off if they submitted their reflection sheet, completed quizzes, and notebook for grading. I keep the reflection sheet/quizzes in a filing cabinet, and I'll pass them back at the end of the year for them to review. I'm hoping this makes review go much smoother. A copy of my file is uploaded here. 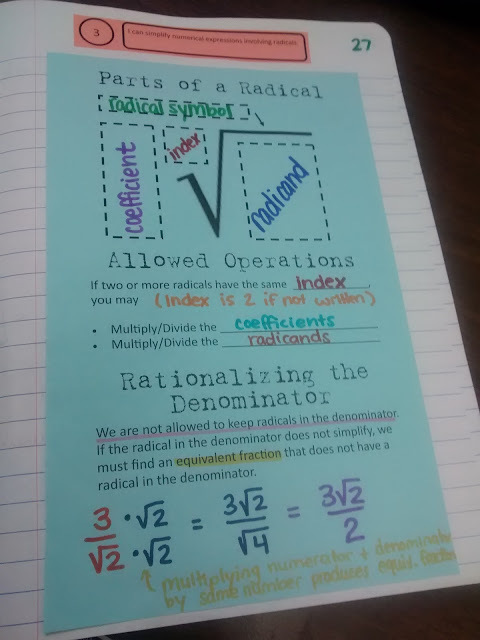 I've never really known what to do about teaching radicals in Algebra 1. 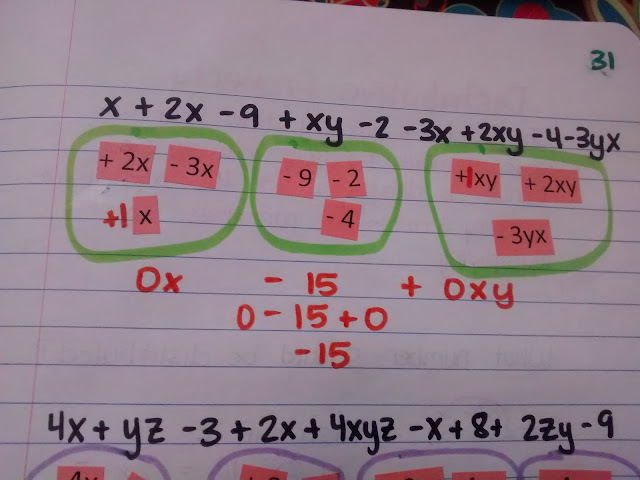 Oklahoma's Algebra 1 standards currently have students simplify expressions involving radicals in Algebra 1. This is not the same as simplifying radicals - that happens in Algebra 2. In the past, I've taken several approaches. I either skip radicals altogether and tell students to type them in on their calculators come test time. 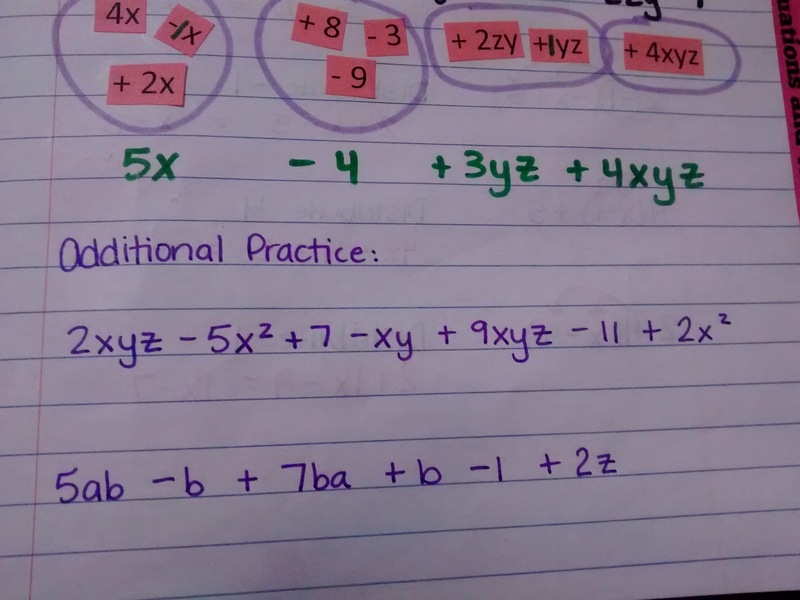 Or, I go all-out and teach simplifying radicals, adding/subtracting radicals, and multiplying/dividing radicals. This year, I decided to just teach rationalizing and reducing. It's better than just having kiddos type things in their calculators which teaches them nothing and just helps them pass the test. And, I'm not wasting time by teaching things that won't be tested. My Algebra 1 students are already far behind, so time is at a premium. Plus, this is a high-stakes class. They must pass the end-of-instruction exam to be eligible to graduate. We are slowly but surely making progress, though. If you notice at the top of the page, this is skill 3 for the year. It directly follows order of operations/integer operations and fraction operations. 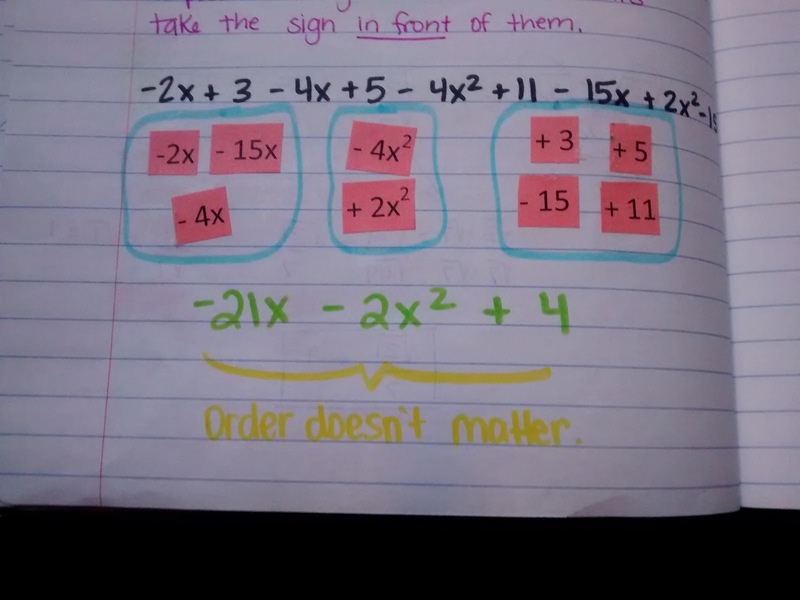 I specifically taught it after fractions because I wanted to rely on the idea of equivalent fractions for teaching rationalizing the denominator instead of teaching kids to memorize the steps for how to rationalize. This year, I decided to take a different approach. I told them that our goal was to get rid of the radical on the bottom. Then, I encouraged them to think of a radical that could be on the bottom that would simplify. Now, what can we multiply the denominator by to make it into that radical? This worked sooooooooooo much better. If students had a radical five in the denominator, they recognized that if it was a radical twenty-five that the denominator would reduce to five. Thus, they should multiply the numerator and denominator by radical five. Some students caught on to the shortcut that I used to teach my students. 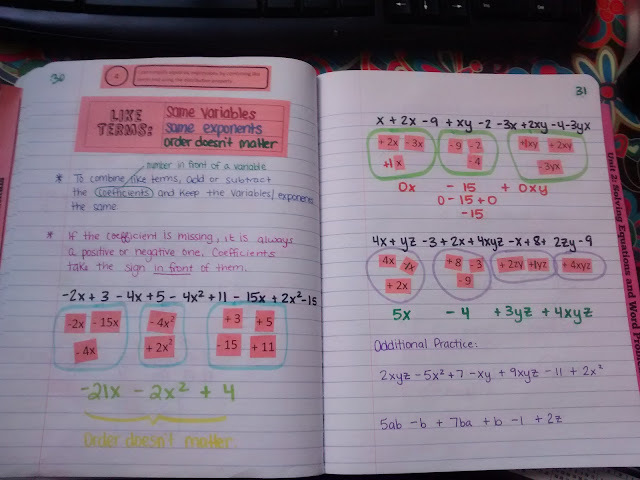 Other students get out their square root chart and think through the process of what to change the denominator to each time. Either way, students are thinking about what they are doing instead of blindly following steps, and that has me so excited. Why has it taken me so long to figure this out??? Download the file for this lesson here. 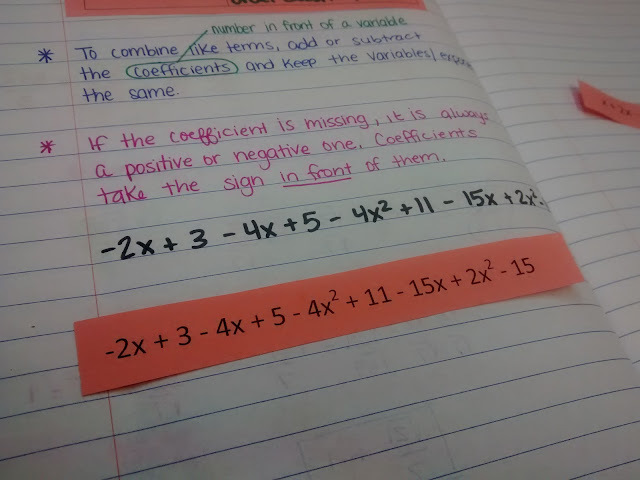 This year, I decided to really emphasize combining like terms with my Algebra 1 students. In retrospect, I should have done the same thing in Algebra 2 because they were still struggling with what they can and cannot combine. I thought this would be a one day lesson, but it ended up taking my students two days to work through it. There were lots of great conversations happening, so I think it was definitely worth it! 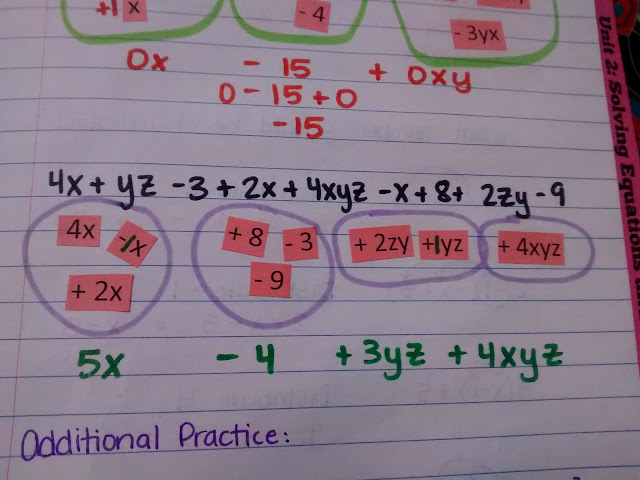 I gave students a quarter sheet of paper that had a note box and three polynomial expressions. We began by taking some notes over what like terms are. I really wanted to emphasize to my students that xy and yx are like terms, so I really pushed the "order doesn't matter" this year. I had them copy down the first polynomial strip in their interactive notebooks. Then, the students had to cut the strip into terms. This led to a great discussion of what a term is. Students had to make sure they cut the strip so that each term contained the sign in front of it. Students were super careful to make sure they were cutting the strips correctly which is exactly what I was hoping for. Next, I instructed students to group the terms into groups that were like terms. This is where the best conversations happened. After students sorted their terms, I asked them how many groups they had. When students realized they had sorted into a different number of groups, they started justifying their groupings to their classmates. It was just awesome to see them pointing each other back to the definition of like terms. Finally, we decided on how the terms should be grouped. 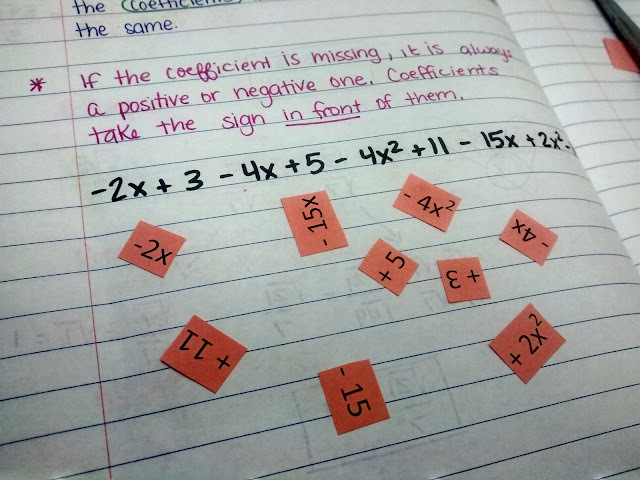 Next, I instructed students to glue in their groupings. I intentionally did not tell them how to group them in. Luckily, the students glued them in different orders which let us discuss the fact the order of the terms doesn't matter. 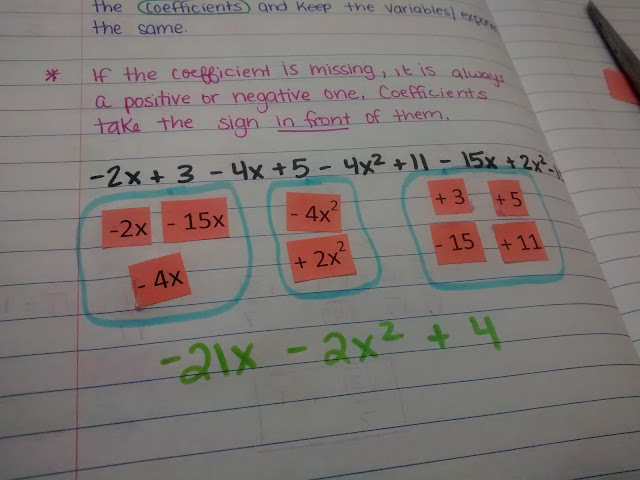 Finally, we circled the groups and combined the coefficients. Since the students glued the groups in in different orders, their terms ended up in different orders. I emphasized that this was okay as long as the sign in front of 21x was negative, the sign in front of 2x^2 was negative, and the sign in front of 4 was positive. Next, they proceeded to do the next two problems in their groups. The zero coefficients and invisible one coefficients freaked some of my students out, but they persevered. We finished the class period off with two additional practice problems. The kids were quite miffed that I did not give them strips to cut because how else would they figure out what the terms were. 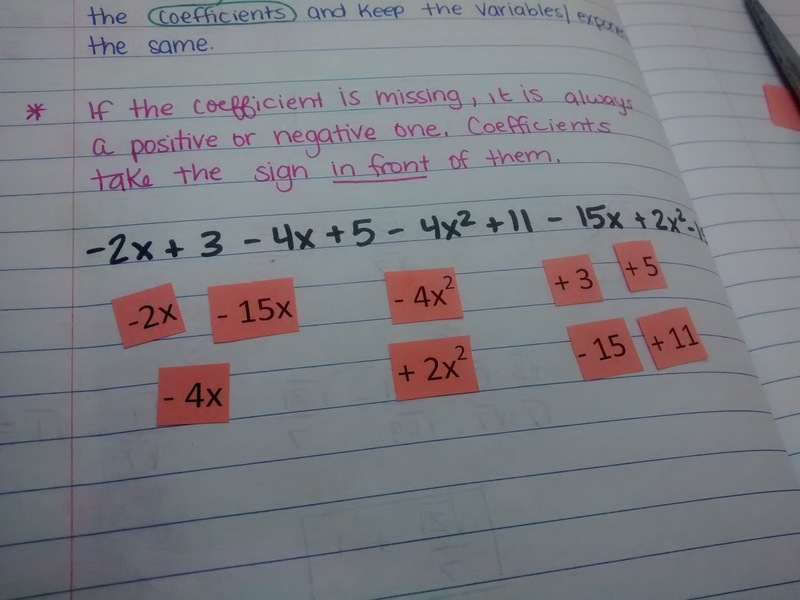 To remedy this, many students drew "cut lines" between the terms to separate them. 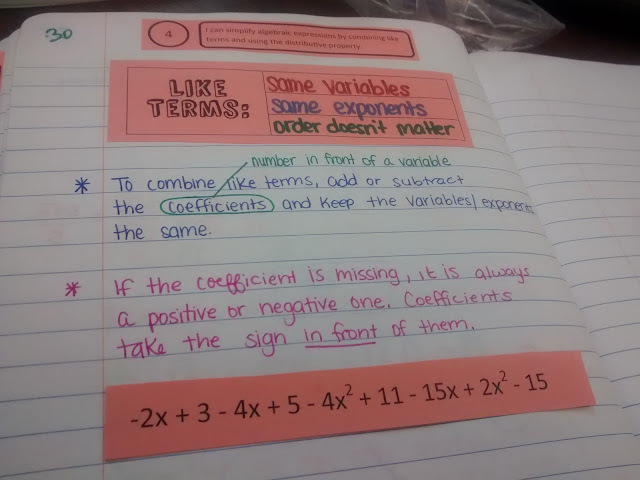 I like this activity got students actually separating terms, grouping them, and combining them. I hope I made an abstract concept a little more concrete and understandable for my students. File for this lesson found here (PDF and PUB).